Joe Kendall struck an unbeaten 230 as record-breaking Lincolnshire CCC beat Eastern Division leaders Buckingham. His innings included 33 fours and a six as he finished just two runs short of the county’s highest-ever individual score of 232, set at Grantham in 1925 by Raymond Frearson against Cambridgeshire. Kendall becomes only the fifth-ever Lincolnshire player to score a double century in Championship cricket. Louis Kimber also recorded his maiden century for the county, scoring 137 as Lincolnshire recorded 486-3, breaking their highest ever Championship total of 483-3 against Bedfordshire at Dunstable in 1999. Lincolnshire gave a debut to Alex Moor in this three-day fixture. On a very hot and sunny day Buckinghamshire won the toss and elected to bat. Lincolnshire quickly made inroads into the home side’s batting order and reduced them to 28-5, with Dan Freeman accounting for three of their wickets. Buckinghamshire’s scoring rate was extremely slow in the face of fine controlled bowling by Lincolnshire’s attack. The visitors continued to force home their early advantage and two further wickets saw the total reach 81-7. Matt Rance and Cameron Parsons then put together the highest stand of the innings, adding 58 for the eighth wicket before Matt Fowler dismissed the dangerous Rance for 33. Fowler then removed the remaining Buckinghamshire batsmen as the home side were dismissed for 147 in the 66th over. Dan Freeman (4-22) and Matt Fowler (3-10) were Lincolnshire’s most successful bowlers in securing maximum bowling points. Kendall and Chris Jones opened for Lincolnshire and batted solidly and sensibly and, at the same time, maintaining a steady run rate. Both players passed their half centuries and had put on 123 together before Jones was dismissed for 66. Louis Kimber joined Kendall and they took Lincolnshire into the lead and by the end of day one they were 168-1. Day two was hot and sunny and Kendall and Kimber batted on and on to put Lincolnshire in a strong position. Kendall passed his century, as did Kimber, as the total passed 300 and then 400. Kimber was finally out for 137, his maiden century for Lincolnshire in Championship cricket, having added 282 with Kendall for the second wicket. His innings contained 18 fours and two sixes and was meticulous in technique and concentration. Bilal Shafayat joined Kendall, who soon passed 200 as the pair added 78 in quick time before Shafayat fell for 28. By the end of Lincolnshire’s allotted 90 overs, they had reached 486-3. With a first innings lead of 339, Lincolnshire were now in a commanding position with plenty of time left in the game to enforce a victory. They made a sensational start when Buckinghamshire batted again with Alex Willerton reducing the home side to 4-2. There then followed a fine stand between Alex Woodland and Michael Payne, who added 161 for the third wicket before Willerton struck again having Woodland caught behind for 68. Willerton struck for the fourth time in the innings, dismissing Khan for nought and James Kimber had Pritchard caught behind for 4, leaving Lincolnshire requiring five wickets on the final day to secure victory. Day three dawned hot and sunny as Lincolnshire’s bowlers toiled in the oppressive heat to dismiss the Buckinghamshire lower order. Michael Payne reached a fine hundred for the home side before debutant Moor trapped him lbw for 125, leaving the hosts on 233 for 7. Matt Fowler then had Matt Rance caught for 29 with the score on 261, some 78 runs short of ensuring Lincolnshire had to bat again. Cameron Parsons and Tom Hampton then took the attack to the tiring Lincolnshire bowlers adding 87 for the ninth wicket before Willerton dismissed Hampton for a valiant 48. Willerton also accounted for last man Burden, leaving Parsons not out on 64 and the final Buckinghamshire total on 375. Willerton starred for Lincolnshire, taking 7 for 92 off 28 overs. Lincolnshire now required just 37 for victory and reached this target for the loss of two wickets in mid-afternoon. 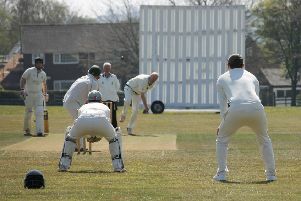 Lincolnshire took a maximum 24 points from the match and moved into second place in the Eastern Division table. Their next three-day fixture commences on Sunday, August 5 at Grantham, when they face Northumberland (11am).